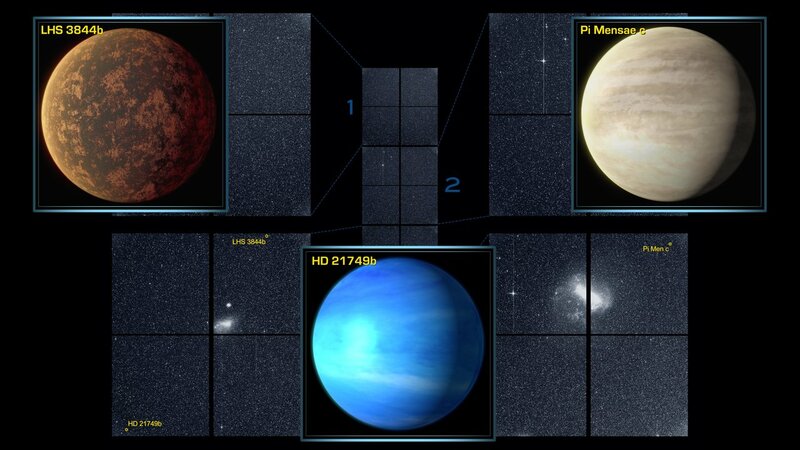 The first confirmed discovery  is a world called Pi Mensae c about twice Earth’s size. Every six days, the new planet orbits the star Pi Mensae, located about 60 light-years away and visible to the unaided eye in the southern constellation Mensa. The bright star Pi Mensae is similar to the Sun in mass and size. Next is LHS 3884b , a rocky planet about 1.3 times Earth’s size located about 49 light-years away in the constellation Indus, making it among the closest transiting exoplanets known. The star is a cool M-type dwarf star about one-fifth the size of our Sun. Completing an orbit every 11 hours, the planet lies so close to its star that some of its rocky surface on the daytime side may form pools of molten lava. The confirmed planet, HD 21749b, is about three times Earth’s size and 23 times its mass, orbits every 36 days, and has a surface temperature around 300 degrees Fahrenheit (150 degrees Celsius). “This planet has a greater density than Neptune, but it isn’t rocky. It could be a water planet or have some other type of substantial atmosphere,” explained Diana Dragomir, a Hubble Fellow at MKI and lead author of a paper describing the find . It is the longest-period transiting planet within 100 light-years of the solar system, and it has the coolest surface temperature of a transiting exoplanet around a star brighter than 10th magnitude, or about 25 times fainter than the limit of unaided human vision. An artist's visualization of the exoplanet LHS 3884b.